Today on the podcast we have Desha Peacock. Desha is an international retreat leader, lifeSTYLE Design Coach and the Founder of Sweet Spot Style. Desha works with creative entrepreneurial women to upgrade their lifestyle and live fully in their sweet spot. She is also the author of Create The Style You Crave and Your Creative Workspace. Today on the podcast we are diving into how to create a work environment that inspires you. We will be touching on light, colors, wallpaper, Feng Shui and all the things that you need to focus on in order to be more productive and work in a space you truly appreciate. A workspace means different things to different people, depending on your personality and what you do. Desha’s job is not to be a “style guru,” but rather to help people think about what is important to them and what kind of workspace would inspire them. Whether you have a formal office space, work from home, or have a tiny corner in your room – Desha is going to help us create a space that will enable us to do our best work. Recognizing What Type Of Workspace Lights You Up. Some love a messy studio and some like a minimal, clean workspace. For Desha, she personally doesn’t like to worry about how neat her workspace is when she is in creative mode. Her husband, for example, is slightly OCD and can’t handle any form of untidiness! So first off, you have to take notice about what kind of workspace lights you up and gives you energy and then set up some rituals to set that in place for you. A lot of people don’t have the luxury of a designated creative workspace but Desha believes that no matter where you work from, everyone deserves their own little sweet spot. Even if it is just a corner where they can create what they want and that reflects who they are. As much as we all want that “perfect” workspace, the truth is, you don’t need anything but a table and a chair. So number one, don’t let the fact that you don’t have a “perfect” workspace stop you from creating. You have everything inside of you right now to be able to do it. So, pull up a chair next to the table and get going with these helpful hacks! If Your Space Is Limited, Get Creative! We are all inspired by our environment. If you have a small space, or have no space at all, Desha recommends that you try to get creative with it. Look around your space. Do you have a bedroom? Most of us do, right? So find a corner, find a way to put a desk next to it and figure out how to make it a designated space for you. Whether that’s with wallpaper, a vision board, an artwork, or a shelf for your books and flowers. You can even scout around your house, find the best light and get a desk in there. Small things like that will immediately make it feel more like an office space. People are creating office spaces all over the house, in hallways, in the dining room and even in closets, so find the space that works! What often helps determines where one works in the home, is what projects you will be working on for the day and where the best place to do them is. For Emylee, if she is writing, she knows that she needs a bit of noise and activity around her for her to write her best. So for this task, coffee shops are great. For other tasks, Emylee likes the quiet of her office. So really, it’s about checking in with yourself and asking, “How do I want to work today?” For Desha, writing from home is too distracting, so she likes to go and write from a nearby public library. Sometimes, you just really need to get out of the house. Work out what you need and the next step is to apply it. Creating The After Work Workspace For Those With A Nine-To-Five. If you are coming home from a nine-to-five and work in the evenings on your creative projects or your side hustle, then you need to let whoever else is in your home know that this is what you will be doing, so that everyone is on the same page with expectations. Talk to your family and let them know your at-home work schedule, so that they can allow you that time to focus in order for you to be fully present for the rest of the time at home. Find your quiet place, get in there, and close the door! If you are working in the night time, Desha likes to burn lemon essential oil because it smells like light, it wakes you up and gives you focus. Make bit of effort to create a comfortable space and when you are there – actually work. Don’t use that sacred time away from your family to scroll your Instagram. Do the work you set out to do. Your body gets attuned to doing certain activities in a certain space. So if you make a habit of writing at a library and then come home to write, sometimes it is difficult. Your body learns those environments and craves them, which is great, because then you can just slip into the task at hand when you are in those spaces. So try to get into some from of rhythm. Happy Lights For Life And Other Productivity Hacks. Desha dedicated a whole chapter in her book to light and how it can effect your mood and productivity. What Emylee’s mom has done at her home is install really bright, office-type lighting to her workspace to help her get into work mode in the middle of the night, for example. Offices can get dark and having daylight light bulbs can make a massive difference. Certain colours in your workspace can also bring about different moods. The colour blue for example is definitely calming. Yellow can help you to focus but if it’s too bright it can cause some anxiety in people. Green is the colour of abundance and growth and so having a lot of green plants around you is a great thing to bring into a space if that is what you need most. Having those colours in your space can almost be an affirmation of what they represent. Colour can also bring out different feelings for people of different cultures because colours have different meanings and cultural attachments. It’s also great to create little pockets in the day that enable you to move around a bit. How much more could you get done if you just left your desk or your couch and just took a short walk outside? The effects that has on your body will make you more productive. Desha schedules those sorts of things in her planner, like “Go for quick walk after lunch.” Because otherwise she’ll just go, go, go and then later realizes that she hasn’t really taken care of herself. So many of us have that privilege working from home, yet we are the ones forgetting to do it! So many of use choose this entrepreneurial life so that we have that freedom – but what is the point if we don’t do it. If you take care of yourself, huge things are in store for you so make sure that you do. Don’t let the fact that you don’t have a 'perfect' workspace stop you from creating. What The Fudge Is Feng Shui? Tips For Balanced Energy In Your Workspace. There is much more to Feng Shui than keeping your toilet bowl closed (because if you leave it open, money will disappear). This is just one theory! However, Desha has a section in her book dedicated Feng Shui and she has a few tips for a Feng Shui workspace. When in comes to your desk, positioning is a biggie – ideally you want to have your desk as far as possible away from the door but without your back facing the door. In Feng Shui, this is called the commanding position. By facing an open doorway, you are inviting success and business. If you are unable to move your desk into this position, then have a mirror put up so that you can see a reflection of the door. There is a simple chart Desha has in her book for your actual Feng Shui desktop space. In the right top corner of your desk, is love and relationships. So you would want to have something that is good for that, like a plant or a little sculpture that is representative of that. Underneath that would be creativity and underneath that would be helpful people and travel. So it might be nice to have something that represents that. Like a little map or something you picked up on your travels. In the middle quadrant, at the top, would be fame, fortune and reputation. Then the last quadrant is mind, body and spirit and then career, life and purpose. The left hand corner at the top of your desk is abundance and prosperity. Desha, has a pink salt lamp in this corner of her desk. Because salt lamps (and plants) are good for neutralizing energy from digital devices. Know that the energy that you put out into the world, you are calling back to you. This can be anything from your personal style, the way you dress, to your home and your office. At the end of the day, it comes down to respecting your space. Reflecting who you are in that space, so that you can get that energy back. It doesn’t have to be perfect before you start. Talk to your family and set expectations. Desha Peacock is an international Retreat Leader, LifeSTYLE Design Coach, and Founder of Sweet Spot Style. 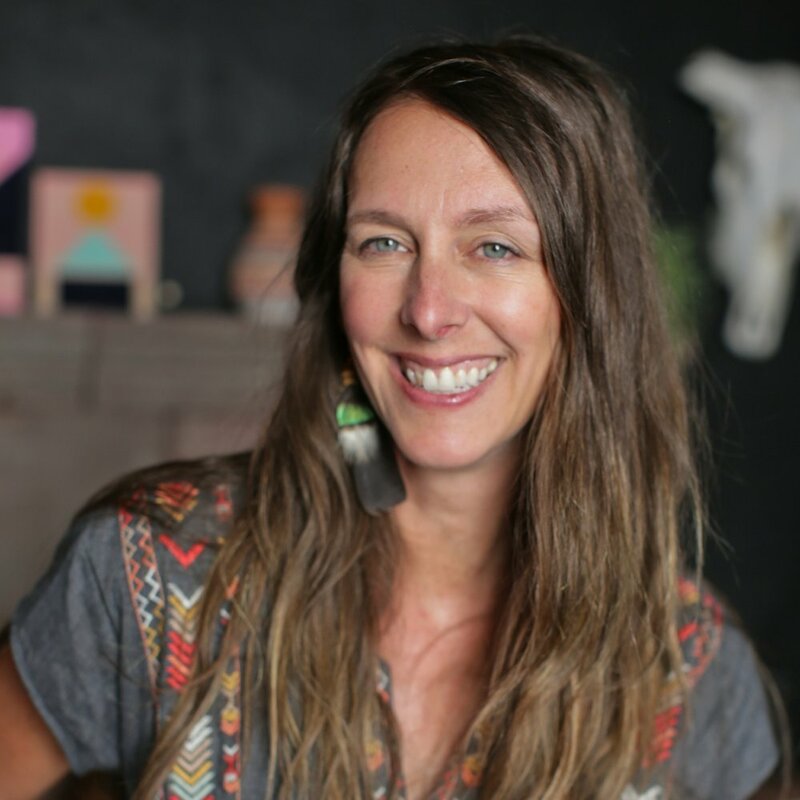 Peacock works with creative entrepreneurial women to upgrade their lifeSTYLE and live fully in their sweet spot. She is also the author of Create the Style You Crave and Your Creative Work Space. Peacock holds a master’s degree from The School for International Training, is a certified Global Career Development Facilitator, and has led workshops and retreats across the globe. She’s been quoted or featured in Origins Magazine, Design Sponge, Flea Market Décor Magazine, The Jungalow, ABC.News, The Huffington Post, The Houston Chronicle, YahooNews.com, Career Rookie, and US News Money and has made radio and TV appearances across the nation.